Did you try to make pulled pork in your pressure cooker before? Its absolutely amazing and easy to prepare dish. 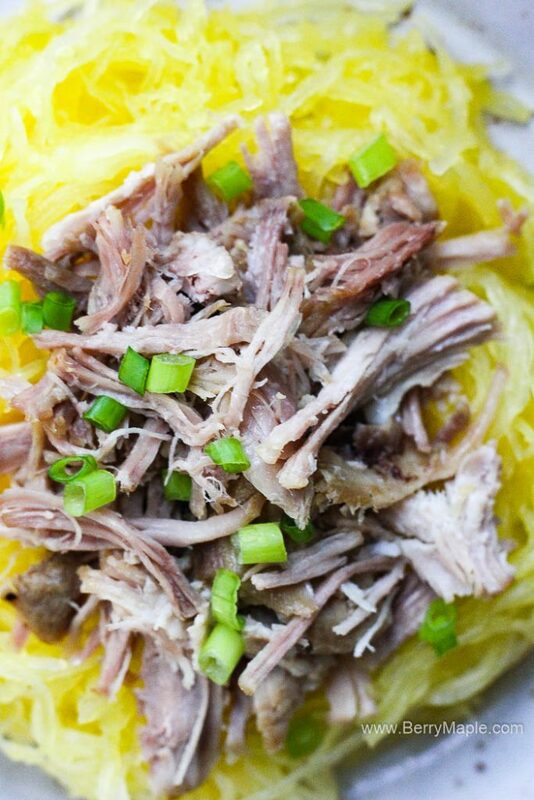 Now imaging that you can combine healthy spaghetti squash with pulled pork… its a bomb! You can prepare it using just one pot, no extra dish washing required! 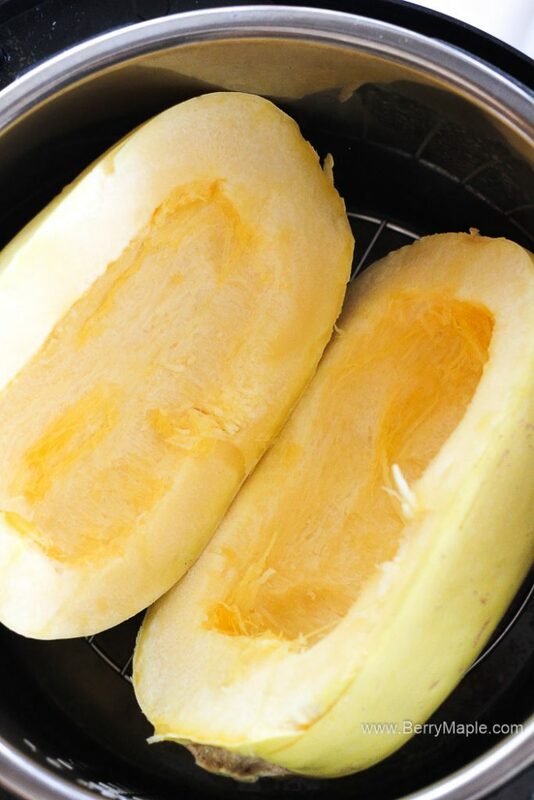 How to cook spaghetti squash in Instant Pot? Its very easy! It takes less then 10 minutes under pressure and so delicious and healthy! First you need to place a trivet in to your inner pot. 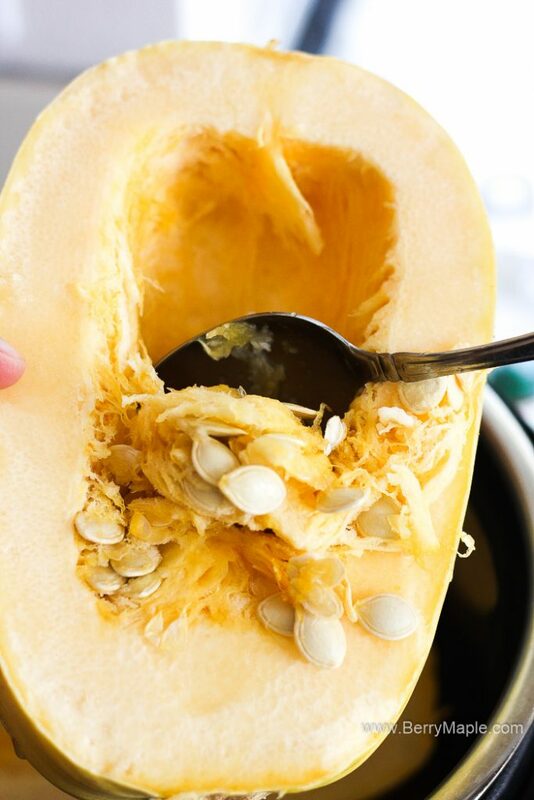 Cut your spaghetti squash in half lengthwise and remove all seeds. Set for 8 minutes under high pressure. Quick release. Now the fun part! Shred the squash and serve! Yum! 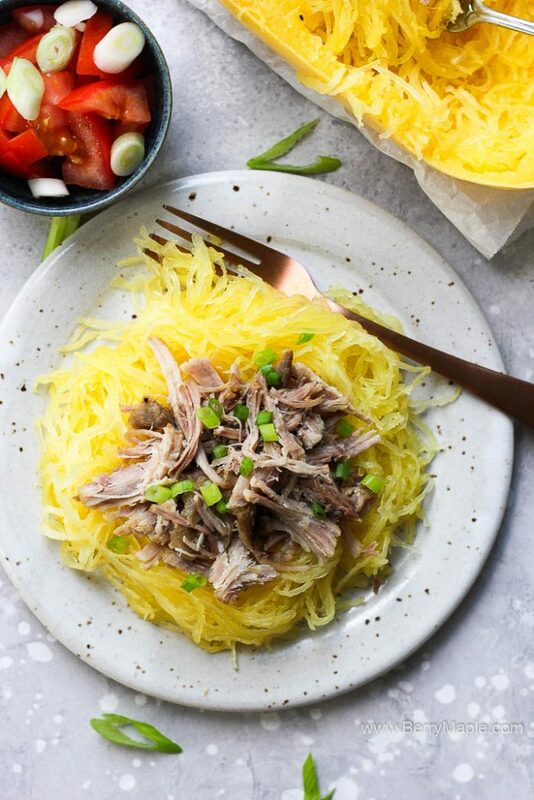 When you make pulled pork with spaghetti squash together, first you need to cook your pork shoulder because it takes much longer to cook it all the way through. 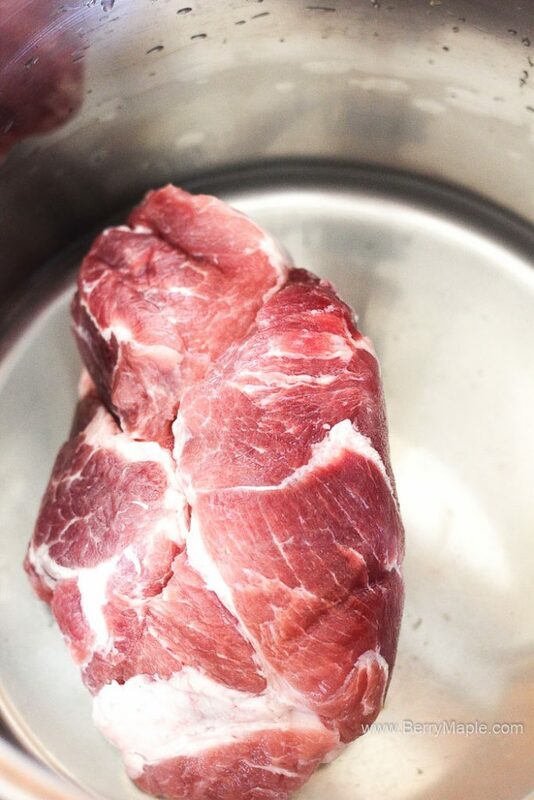 You will need to place pork shoulder in the pot, add water and cook for 40 minutes on high pressure. Once its done, Quick release the steam. Place the trivet right on top of the pork and add you prepared spaghetti squash. Cook for another 8 minutes on high pressure and QR in the end. 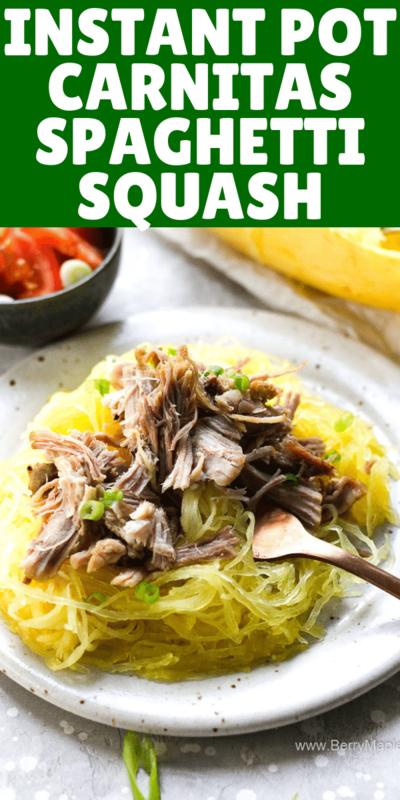 Squash will soak up some of that pork flavors and will be absolutely amazing! You don’t need much seasoning here, except salt and pepper. Be sure to check out my Instant Pot butternut squash soup! 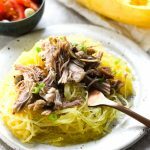 Absolutely stunning but easy to make combo- Instant pot spaghetti squash with flavorful pulled pork. All the best flavors in one dish. Place pork in the Instant pot or any other pressure cooker. Add water , salt and pepper. Close the lid and set the timer to 40 minutes on high pressure. Once done, quick release the pressure. Meanwhile wash your spaghetti squash and cut lengthwise. Remove seeds. Place the trivet on top of the pork. Add prepared spaghetti squash. If it doesn't fit, cut it in quarters. Sprinkle with some salt and close and lock the lid Set the timer to 8 minutes high pressure. After its done- quick release it. Carefully remove the squash. Shred it, leaving just skin Remove pork and shred it separately, mixing with juices. Serve. Place squash on the bottom, then add some pulled pork with juices on top and sprinkle with some chopped scallions. 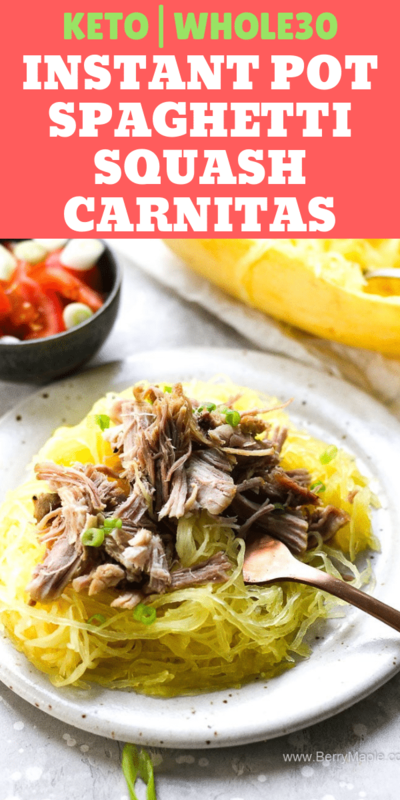 Such a delicious combo and I love that I can get more use out of my Instant Pot now! Glorious!! 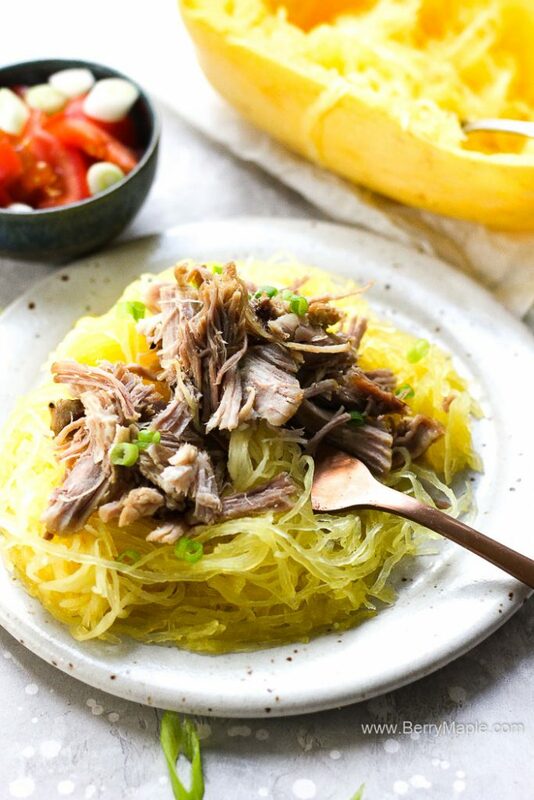 My husband just recently agreed to try spaghetti squash for our dinner menu, and this was the perfect recipe to start him with with the addition of pulled pork which he already loves!